Now that Engage Box is out the door it's time to show to everyone 5 extremely efficient uses of it. Before we go any further though I would like to emphasize that while Engage Box is the tool, it's the administrator's choices of using it which determine its efficiency at the end. Let's see how you can start using it right! Social media outreach is essential in growing your user-base and widening your reach. One can only assume that since you are reading this post about conversion rate then you must have already set up a Facebook Page for your website. Through Facebook you are able to expose your brand to the public and increase awareness for your service or products. Some might say that the likes you get through your Facebook page are valuable only the moment you get them. Obviously that's not true because people will share your content without a second thought if it is agreeable to them. Just imagine that each share exposes your content to hundreds of, unknown to you, audience which you would hardly be able to reach them without your Facebook page. Facebook likes are earned and not needlessly given. 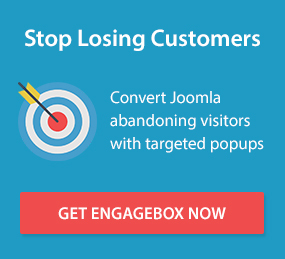 Don't bombard your users with a Facebook Like box everywhere! Instead, take extreme care of when you decide to pop your box with your Facebook Page inside it! If you'd like to know how you can set it up, take a look here. One of the biggest concerns regarding user session longevity is how to keep giving them incentives to stay in your site until they finally convert. One way to serve the solution towards this concern is to detect when they are about to leave and try to change their minds at the last moment. In order to persuade them to stay you need a strong call-to-action which needs to be simple and as targeted as possible. There is a strong chance that if this call-to-action is successful then your user will most likely convert and you'll have succeeded. Needless to say that simplicity is key for your call-to-action to work. It's difficult to keep your user to your website if he is still a lot of steps away from converting. With that in mind you should carefully use this technique when it is actually fitting and most likely to succeed. Using it elsewhere there's a great chance that you'll end up with a disgruntled user rather than just an indifferent one which would be the best case scenario in this case. There are a lot of ways to track when a user is going to leave your website and Engage Box has most of them covered already. Here's how you can implement one right away! The traditional navigation of a website serves its purpose when there is not a lot going on with the website to begin with. If your website has quite a lot of content it's nearly impossible to categorize everything right and cram it into a navigational menu. At best, your user will have to click three or more times to circumvent the various taxonomies to find what he needs. For this problem there's a really good solution and it is showing him the related content to anything he is reading at the moment. Giving him more content to consume with this easy and simple way lessens the bounce rate a great deal and this in its own way shows a healthy website towards your advertising networks and partners. There are a lot of ways to show related content. Most websites choose to show related content right under the article in a module-like fashion. I suggest that you try and keep your article page as clutter-free as possible and instead show them your related content through Engage Box which gives you the flexibility to choose the timing and the appearance in a more targeted fashion. So, if you want to go ahead and do this then you should have in mind that a prerequisite for this case is that you have a Joomla module installed which takes care of showing the related content. Through Engage Box you get to show that module whenever and however you want! Check our example of how to set it up easily. Content locking is a powerful way to generate leads. 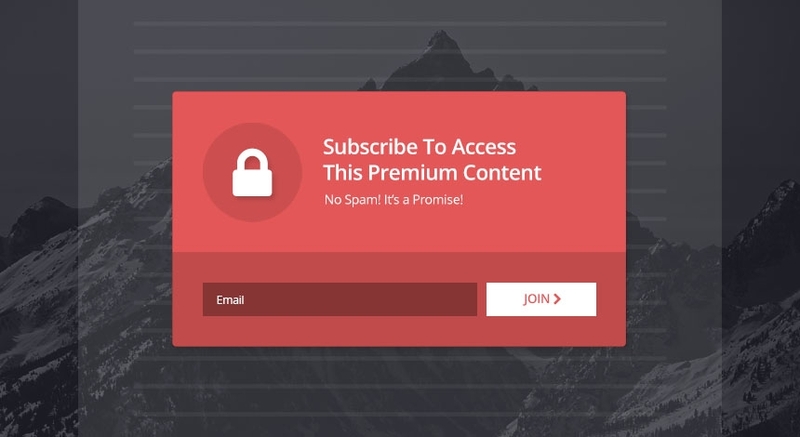 They most efficient way of content locking is to limit access to certain contents by declaring that the user must subscribe to your website or to your newsletter. Of course there is a thin line between using this technique in a reasonable way and being just obtrusive. If you want to avoid being obtrusive then you have to be sure to have indeed great content and your call-to-action message be simple with a clear way to be done with it as fast as possible. Keep it as simple as possible. Let the user see your content immediately after. If you already have Engage Box and you want to implement a content lock then all you have to do is create a centered box with a non-scrolling full-screen background and assign it to the content you'd like to lock. Just make sure that you trigger it only on targeted audiences such as unregistered members. Here's a step by step process. My last use case is, in my opinion, the most important of all! E-mail subscription is the most vital component of an increasing user-base	and, to an extend, converting user-base as well. Having a direct connection to your user is an absolute must if you want to keep him in the loop for new products and services or upgrades of the ones he has already purchased. Of course emails and newsletters go hand in hand and if you add a pinch of personalization in the mix then you are sure to have the most precious asset in the business, a loyal customer. Loyal customers are very much sought after not because of the guaranteed income but because of their reach towards people who wouldn't be able to know you otherwise. So here's my tip, find your loyal customers, identify their needs and try your best to keep them happy! These are just some suggestions out of countless different variations or distinct cases all-together. Increasing your user-base and your conversion rate is a topic worth unending research. The Web has created a user who craves of instant gratification and it gets harder by the minute to earn their trust. In this on-going fight Engage Box is, and always will be, your ace up your sleeve. So, what do YOU use to maintain a rich user-base? Leave a comment below!